The fifth round of the U.S.-China Strategic & Economic Dialogue gets underway in Washington, D.C. this week, as Americans continue to have very mixed feelings about their relationship with the nation’s second-largest trading partner (after Canada). A Pew Research Center survey conducted in collaboration with Carnegie Endowment for International Peace last year found that 56% of Americans said it’s “very important” for the U.S. to be tough with China on economic and trade issues, and 52% said China’s emergence as a world power constituted a major threat to the United States. 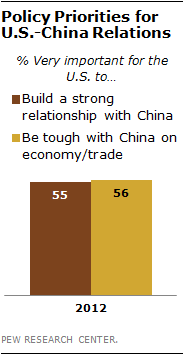 At the same time, 55% of the U.S. public said building a strong relationship with China should be a top priority, and nearly two-thirds (65%) said U.S.-China relations were “very” or “somewhat” good. A separate Pew Research survey conducted earlier this year found sharply differing attitudes among the U.S. and Chinese publics on their respective economies. Fully 88% of Chinese called their country’s economy good, up 6 percentage points from 2007; only 33% of Americans said the same thing about the U.S. economy, a 17-percentage-point drop from 2007. Chinese were also more optimistic: 80% said they expected their nation’s economy to improve over the coming 12 months, compared with 44% of Americans who felt that way about the U.S. economy.